Alexander Krasinsky was born in 1947 in the city of Tokmak, Kyrgyzstan. In 1965 he graduated from secondary school No 108 in Mariinsk, Kemerovo region. From 1965 to 1971 he studied at the Tashkent State University and the Faculty of Mechanics and Mathematics, the specialty of "mechanics", and the specialization "general mechanics". In 1970-1980 he worked as an engineer of the department "general mechanics". During this time, he organized two training laboratories: theoretical mechanics and the theory of gyroscopes, as well as analog and hybrid computers. In 1973-1974 and 1978 he passed semester internships at the Institute of Mechanics of the MV Lomonosov Moscow State University. In 1982 he defended his thesis "On the stability and stabilization of equilibrium states of mechanical systems in some critical cases" at the Council of the University of Friendship of Peoples, Moscow. In 1980-1989 he worked at the Department of Applied Mathematics (since 1999 the theory of optimal control) of Tashkent (since 1999 National) University as an assistant, assistant professor. In 1989-1991 he was a seconded doctoral student at the Department of Theoretical Mechanics and Mechatronics of the MV Lomonosov Moscow State University (scientific consultant Academician of RAS Prof VV Rumyantsev). In 1992 in the Council of the Faculty of Mechanics and Mathematics of Moscow State University MV Lomonosov defended his doctoral thesis "On the Stability and Stabilization of Uninsulated Steady Motions". In 1993-2005 he worked as a professor at the Chair of Optimal Control of the National University of the Republic of Uzbekistan. In 2000-2005 he worked simultaneously as a professor at the Department of Mechanics of this university. Lecture courses on optimization methods and operations research, variational calculus, differential equations theory, optimal control theory, dynamic programming, mathematical theory of designing control systems, stabilization of nonlinear systems with incomplete information, adaptive control theory, dynamic systems modeling, analytical mechanics, and dynamics of non-holonomic systems. In 1997-2005 he was a member of the Council for the Defense of Doctoral Dissertations on Mechanics at the National University of the Republic of Uzbekistan. In 1999-2005 he was a member of the Expert Council of the Higher Certification Commission of the Republic of Uzbekistan in the field of physics and mathematics. In 1996-2003 he was a member of the Expert Council of the State Committee of the Republic of Uzbekistan for Science and Technology. In 1998 and 2002, within the framework of the DAAD program, he underwent a scientific internship at the Technical University of Darmstadt, Germany. From 2005 to the present time he works as a professor at the Moscow State University of Food Production, where he was sent by the Ministry of Education and Science of Russia at the request of the university rector to organize training of specialists in Mechatronics in the food industry. Since 2007, at the same time he works as a professor at the Chair of Probability and Computer Simulation at the Moscow Aviation Institute. During this time I read courses on the theory of automatic control, the fundamentals of Mechatronics, information devices in robotics, computer simulation of Mechatronic systems, the construction of the converters of the motion of Mechatronic systems, the theory of probability, mathematical statistics, numerical methods, stabilization of nonlinear systems with incomplete information. 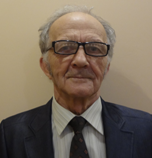 He has published more than 150 scientific papers in the field of analytical mechanics, the theory of nonlinear stability, mathematical and computer simulation of Mechatronic and robotic devices, stabilization of motions of nonlinear systems with incomplete information.